Decal set replica for evinrude 70 hp from the late 70's 1978 Fire Power Ignition. 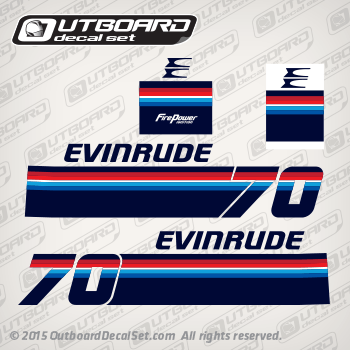 1978 Evinrude 70 hp decal set can replace part number 0281125 and 0281156. EVINRUDE 1978 70873C MOTOR COVER. EVINRUDE 1978 75842C, 75843C MOTOR COVER.